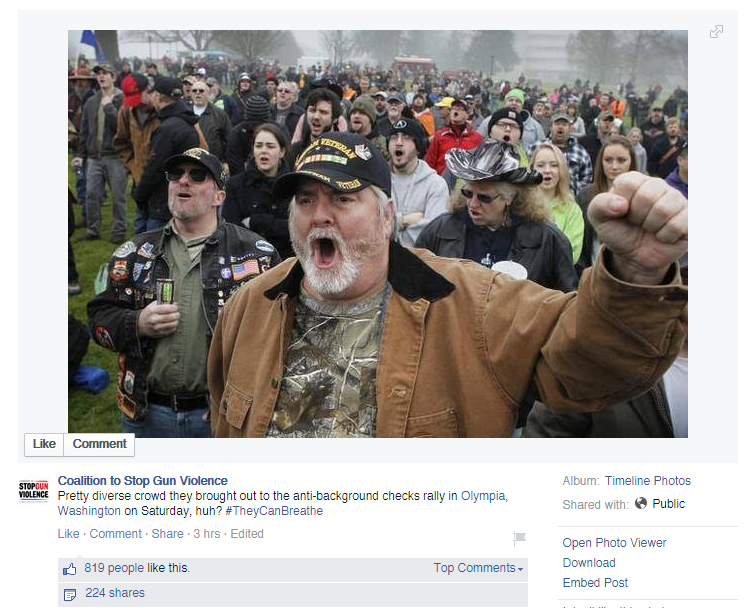 When the Coalition to Stop Gun Violence posts a photo from a pro-gun rally from Olympia, Washington -- population about 43,000, 85% white -- what do they highlight? That's right: "Pretty diverse crowd they brought out to the anti-background checks rally in Olympia, Washington on Saturday, huh? #TheyCanBreathe". Apparently, if you live in an insufficiently diverse area, you need to import minorities to get the right racial mix in your rallies. Aww, who are we kidding, you need to import black people, as shown by the #TheyCanBreathe hashtag. "Does it upset you that most advocates of gun ownership are of the hillbilly, sister f*****g, jebus lover variety?" "But the fact that they were there defines their "values/thoughts/motives"." "Oh come on.......you can totally judge these people by the picture....!" "If by diverse you mean a bunch of paranoid white rednecks...then yes." "Look at the diversity. Some of them wear glasses, and some of them don't. And some of them don't have beards. Like a vision of America right there." "Well, they do have a few women in the crowd, to be fair. But we all know women who vote against their own best interests, don't we?" "All those open mouths, and not a tooth in the lot of them." "Interesting how they all have a certain look. Whether it be Washington State or the Deep South...they all look the same. They need to take a bath and brush their teeth." "More angry old white men... Enough already.. !" "As diverse as a can of mixed nuts"
"Every one of them looks like s/he needs a background check." "It is the anti-government, insurrectionist crowd ....who, by all appearances, are also white supremacists." "Look at all the beer guzzling, fat-gutted, ignorant , poor WHITE trash, hillbillies. The rest of the world sees pictures like this and think this is what America is. No wonder they look down on us as a country beneath contempt. It is so embarrassing!!!!" I could go on and on, but you get the idea. I know this isn't a new point around here, but I like being able to show a clear, irrefutable example of the phenomenon I like to call "the shrieking harpies of tolerance". And not even an ounce of shame to use this kind of language against a man who's likely been through hell (maybe they missed the Vietnam veteran hat). These are the people who would have a picture of Ho Chi Minh hanging in their office and call veterans 'baby-killers' back in the 1970s. I saw the comment that these veterans were likely "in the rear with the gear", otherwise known as "REMFs" or "POGs". But what is more likely - that the grunts who make up the infantry or the rearguard are the ones who support gun ownership? That being said, it couldn't hurt for everyone in this country to dress a little better - give me that time in the 1950s when even the poor, black folks at a protest were wearing long skirts and nice slacks and it only gets better before that time. You are representing your family name and honor when you step outside and present yourself to the public and everyone ought to remember that when preparing themselves to leave the home, especially when they know they'll attend a heavily televised or photographed event in which it will be very likely they'll be misrepresented and denigrated. On my Facebook page, someone said that comments sections are always terrible, and that he could pull up heinous comments on conservative posts. All true. In this case, though, the comments are relevant: The Coalition to Stop Gun Violence was specifically making a point about diversity and therefore its sister principle, tolerance; they were implying that the "rednecks" are less diverse and more intolerant; therefore the intolerance of rednecks and the lack of appreciation for the diversity that attends their presence in our midst is fair game. This is why it is utterly insane to be moderate with SJWs. Christians frequently make the mistake of trying to be reasonable and charitable with them when all of the evidence shows that the person is irrational, hateful and committed toward making miserable everyone who disagrees with them (or worse, like doxxing them and destroying their career). I was there. I saw two black guys, as armed as the rest of us. But it is a zero-sum game, of course. It's true that there's plenty of nastiness in comments threads, but my own anecdotal experience is that racist attitudes towards white people are much more accepted and mainstream than against blacks or any other ethnic group. Evidence of this is in the acceptance of such attitudes in academe, for example. *Most* of the time it isn't expressed as venomously as in anonymous comments threads, but it's definitely more acceptable. Even just saying, "Oh, look at all those white people" and rolling one's eyes, which is pretty mild, is pretty much mainstream leftist thought but would never be accepted if directed at another ethnic group. Even just saying, "Oh, look at all those white people" and rolling one's eyes, which is pretty mild, is pretty much mainstream leftist thought but would never be accepted if directed at another ethnic group. Is this a purely American white self-flagellation thing or is it also seen in Europe (if anyone with such experience could add to the conversation)? And has anyone witnessed or experienced this kind of ethnic self-flagellation in non-European cultures? I would also consider such a statement mild, a kind of humble self-denigration for humor's sake, but it's usually accompanied by much worse sentiments. It's only self-denigration if the person who says it happens to be white. In any event, I wasn't picturing it as being said humorously. I saw the comment that these veterans were likely "in the rear with the gear", otherwise known as "REMFs" or "POGs". But what is more likely - that the grunts who make up the infantry or the rearguard are the ones who support gun ownership? All soldiers no matter the MOS are trained to be soldiers first -- combat ready/dealing/shooting with guns followed by MOS -- so the comment strikes me as a weird one. Is the comment alluding to that since infantry see more damage up close by guns they'd be less in support; or if the type that goes into infantry would be the one to support. Sorta the same with POGs just that they might not see much hand-to-hand damage so they might be in favor. I've worked with veterans who were in support and some who were in combat arms. Never noticed any of them were particularly in favor of gun control. At worst, they were sympathetic to the police harassing open carriers and that's it. That said, you are probably more likely to find liberals among the support occupations because that's where the women are. Mike T, thank you for the acronym correction. GRA, of the many infantry guys I know, almost all of them oppose gun control. I think the more familiar one is with using a firearm against someone who's trying to kill you, the more likely you'll oppose gun control. "All soldiers no matter the MOS are trained to be soldiers first"
Well...it's a nice sentiment and one would hope it's right. Have you seen the recent Army commercial where the drill sergeant asks one recruit why he signed up? He answers "to be a soldier". The drill sergeant scowls. He asks the next recruit the same question, who replies "to be a graphic artist". The drill sergeant says something to the effect of "this guy's got a plan". I'm paraphrasing but I'm not sure the army wants soldiers; it seems they consider themselves an affirmative action college degree attainment program. That's just fiction though, I could share some real horror stories that show the army isn't terribly interested in training soldiers, at least not all of their recruits, and some it has to do with Mike T's comment about support staff bloated with women. A large chunk of the military's problems there could likely be resolved by getting rid of the GI Bill and replacing it with a comparable reenlistment bonus. The fact is that if you go into the military and live thriftly as a young man from 18-22, you don't even need the GI Bill to pay for college because you can save a lot of money. Just max out all of the allowances, live on base, take deployments abroad, etc. Friend of mine graduated college, enlisted for four years as a medic and after four years had a considerable sum of savings because he did all of that. This is a good example of how the SJWs see us.